WisCon 40! What can I say. This was my third year attending a gathering I dreamed of long before I could see it for myself. And WisCon 40 has been particularly special for a number of reasons. 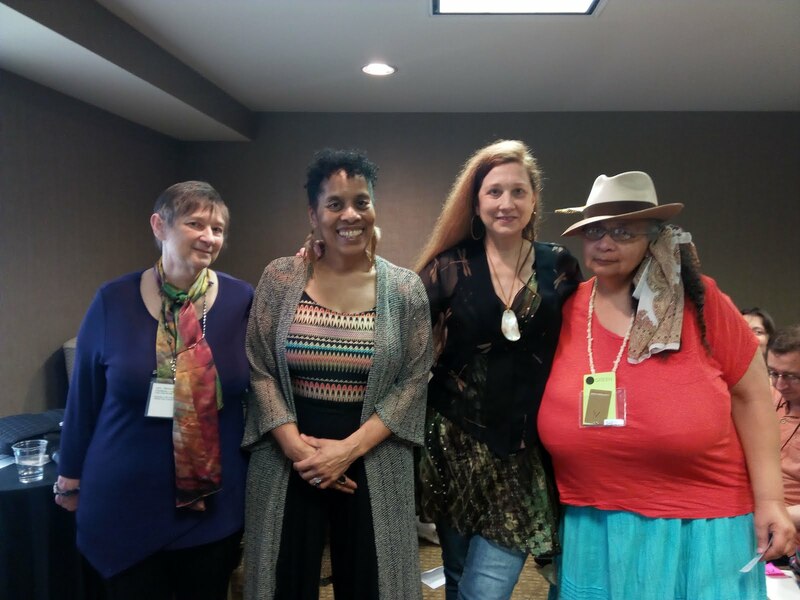 For starters, the Guests of Honor -- Sofia Samatar, Justine Larbalestier, and returning GoH Nalo Hopkinson, whom I had been really excited about since they were announced last year. I’m also happier and more open to the world than I’ve been in a while. I engaged with all sorts of people around me, and it was beautiful. I made friends! All of whom live on a different continent to mine, but that is secondary. Some of the panels and readings I attended were the best time I’ve had in a while, too. 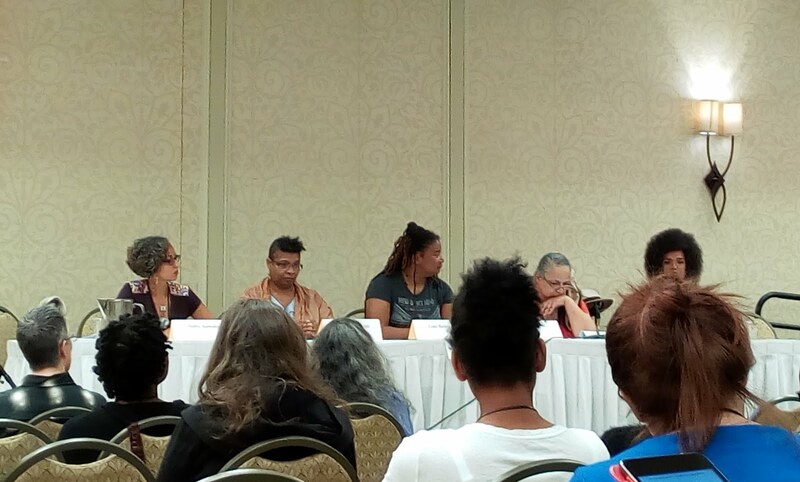 The panel on code switching, with Nisi Shawl and Andrea Hairston, among others, was good fun and packed with ideas to keep developing for months to come. The incredible panel remembering Octavia Butler, moderated by Sofia Samatar, had us all laughing and tearing up and nodding a lot. 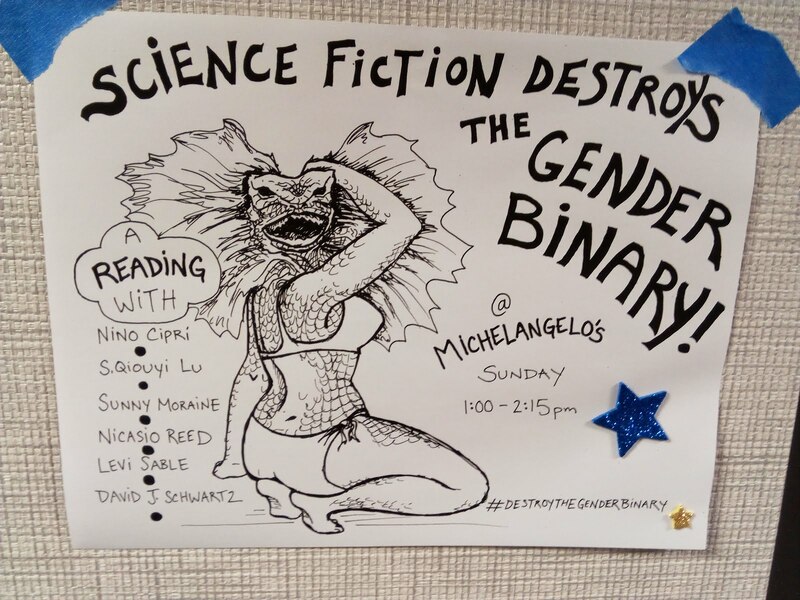 Being able to gather together and cherish the many meanings of Octavia Butler’s legacy for both the audience (whom Samatar invited to participate by suggesting topics for discussion) and a panel of authors I love was a real privilege (and it made my anarcha-feminist science fiction book club in Brighton really jealous). I attended two of the three Aqueduct readings, which always have an intimate feel to them, and the Science Fiction Destroys the Gender Binary! 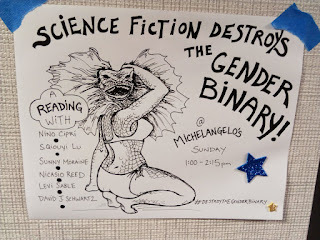 reading at Michelangelo’s, which was a varied, consistently good showcase of short fiction by non-binary writers. Something particularly special about this year for me is that I was a panelist for the first time ever anywhere. Jaymee Goh moderated with great skill and unbelievable energy for a Sunday both of the panels I took part in, one on SFF in translation and one on SFF by women writers around the world. For the first panel I joined S. Qiouyi Lu, author and Chinese-to-English translator, in discussing some of the challenges and joys of our work. 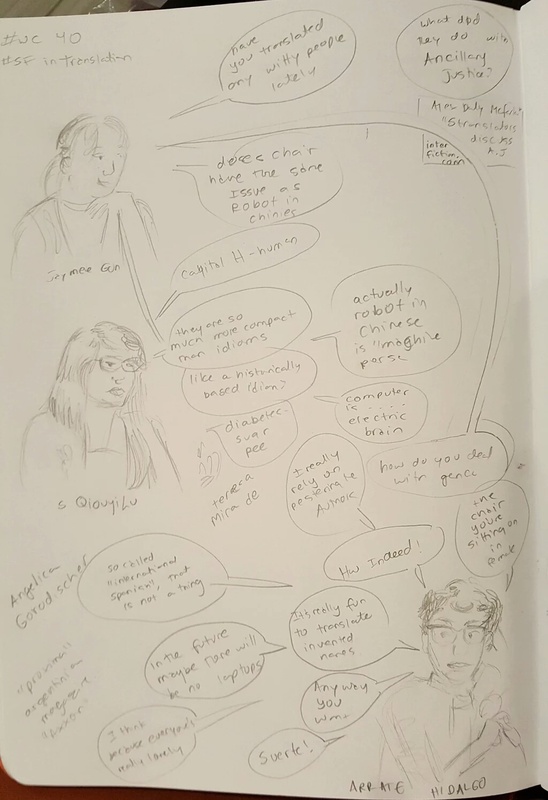 Rachel S. Cordasco made a summary of the panel for the Speculative Fiction in Translation website. 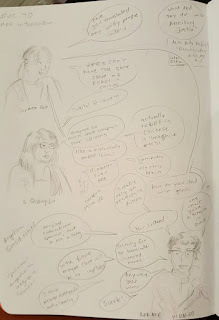 The second panel featured Justine Larbalestier, Jackie Hatton, Emily Jiang, and me, and it involved our taking turns at telling everybody in the room about our favorite SFF from Australia, Japan, China, Finland, Spain, Argentina, and elsewhere. Isabel Schechter live-tweeted both panels (thank you!) and is planning to write up summaries of them, so do visit her twitter account on @MsUppityness. 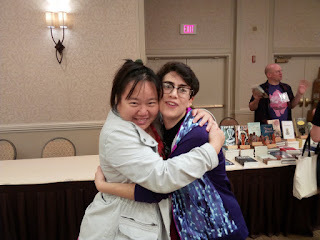 I feel really pleased (and relieved) about the warm reception both panels had, the fact that I can pick up a mic and not panic, and the possibility that both translation and international SFF may thrive at WisCon in following editions. Building bridges between English- and Spanish-language SFF is pretty much my goal in life, and seeing so clearly that I’m not alone planting those seeds in such an extraordinary community fills me with wonder about the future. As I type, Jaymee Goh is suggesting that #InternationalSFF be an regular twitter conversation. It feels great to see things moving. And then there were also the non-panel fun times. I danced and glowed at the Floomp, got my first pair of earrings in exchange for a haiku, hung out with rad authors and booksellers, ate dessert and shed a few tears (no surprises there) during the GoH speeches and Tiptree award ceremony, and celebrated my birthday with a bunch of good people who made me feel so special despite hardly knowing me. I even got a book (Sofia Samatar’s new novel The Winged Histories), the most amazing cosmic hoodie from the clothes swap, and a paper bag full of ridiculously nice improvised gifts (Beer and chocolate? How did they know!). Kath got me a cool snake earring on behalf of Aqueduct, because they're the best. Jaymee Goh, moderator extraordinaire, et moi. In some aspects I still feel a bit like an outsider at WisCon, perhaps for purely geographical reasons, perhaps because I’m not very knowledgeable of the many changes that long-term attendees are perceiving, and which some active members of the community are currently commenting on. But I feel deeply grateful for the space WisCon provides, for the room for improvement and discussion, for all the volunteers that make it happen year after year. Personally, WisCon 41 can't come soon enough. WisCon 40 panel report-- "Our Stories Matter"